a sharp-mouthed thirty-eight-year-old dynamo from Newark, New Jersey, who spoke with an almost comical truck driver brogue and bore “a distant resemblance to Buddy Hackett,” [and] had spent part of his childhood in a Jewish orphanage before learning to survive on the streets by his wits. Klein had made his name by auditing the books of record companies in search of unpaid royalties, enabling him to deliver big paydays for musicians like Bobby Darin and Sam Cooke. By 1968 he had risen to be the manager of the Rolling Stones (not to mention the Kinks and Donovan), and had met John Lennon during the filming of the Rock’n’Roll Circus. For whatever reason John was immediately taken with Klein, describing him as “the only businessman I’ve met who isn’t gray right through his eyes to his soul.” But despite the mutual interest, it took more than a month for Klein to arrange a meeting so he could make his pitch to represent The Beatles. My impression of him when I first met him was: brash – “I’ll get it done, lads.” Lots of enthusiasm. A good guy, with a pleasant attitude about himself in a really gross New York way. And the politics of The Beatles at the time were such that, if John and Ringo were for something, George was too. I’m not sure how things came to this state. When John had first gotten together with Yoko, it had seemed like the split within the group was Paul, George, and Ringo on one side, and John and Yoko on the other. But somehow in the interim the balance of power had shifted so that it was John (and Yoko), George, and Ringo vs. Paul (and Linda). And so it would remain until the final days of the band. Paul had been campaigning for Linda’s father Lee and brother John — business impresarios of some repute — to take over managing The Beatles. But the other three didn’t like that idea, fearing they would be discriminated against. 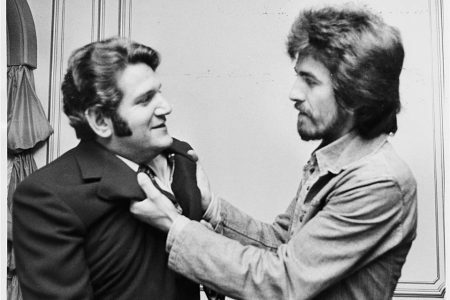 (And they may have been right, who knows, but it’s certainly true that Allen Klein turned out to be no prize.) Frustrated at being outnumbered, Paul walked out of the meeting with Klein, whom the other three immediately voted to install as The Beatles’ new manager. This understandably did not sit well with Paul, and perhaps the biggest wedge so far was driven between lads from Liverpool. It’s quite amazing that, despite all the simmering resentment, they would not only finish the project currently underway but make a whole other album together. It seems unlikely. But at least there was still the music. Today’s session — which fortunately took place before the meeting — was a good one, with the band sounding as lively as they had since the first day of the sessions, and a damn sight more polished. On day 17, The Beatles finally sound like a band you would pay to see. “I Want You” was revisited later in the day, somewhat less successfully, without Billy. At the end of the last take you can hear John say, “Allen Klein’s here. Look out!” And isn’t that where we came in? Yes, I want to receive an email when a new post is published.